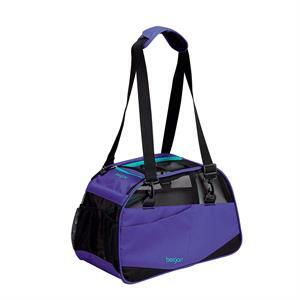 This is the perfect carrier for short trips to the store or extended trips across the country. Intuitive design and active styling are showcased in the Bergan Voyager Comfort Carrier. This series comes in 2 sizes and 5 colors: Purple, Pink, Bright Blue, Air Blue, and Black. Includes poo bag holder and redefined pockets for toys, water or treats . Medium / Large 19"x 10"x 13"